It's almost Christmas, are you ready for the holiday break? Have you thought of the gift you can give yourself? Try out our Rosemary Dead Sea Salt Body Scrub.! 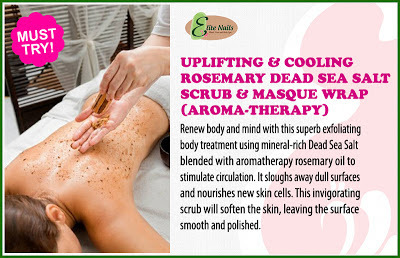 Elite Nails’ spa combines the best organic ingredients and formulations to give you the ultimate body scrub indulgence. It’s the ultimate pampering treat you can give yourself to achieve beautiful skin that you have always dreamed of. The fine ingredients of dead sea salt scrub will delight your skin from head to toe making them smoother, softer and cleaner instantly after the treatment. The cooling effect of rosemary oils with aroma therapy wrap up this refreshing treat and the fragrant of rosemary invigorates the spirit that indeed completes this ultimate pampering experience for both the mind and body. If you want to know more about this treatment or would love to book for a body scrub appointment, you may call these numbers - 09336537276, 09215918801, 09178086950 or at (02) 480-6832. Or check us out at our Facebook fan page and at Twitter (@eliteNailsSpa) too.